Karen and Kieran Armstrong do childcare differently. 192066 Picture: Louisa Jones. Yoga classes, zoo excursions and evening activities to give parents a ‘date night’ are just a few ways Kids World differs in its preschool care. “The yoga helps calm the children for the rest of the week,” explains centre owner Kieran Armstrong. As well as weekly yoga, he and wife Karen offer Friday ‘date night’ sessions every couple of months for parents to reconnect. “They love it,” he says. They also run excursions to Christmas in July at Sovereign Hill, the aquarium, Collingwood Children’s Farm and different zoos. They have a maternal health nurse visit to check the children’s development and even the dentist to check the children’s teeth! “We try to create a centre that has it all,” Kieran says. And the couple look after parents too, with coffees during drop-off and pick-up and even the occasional chef-cooked meal thrown in. “Our new chef, she’s also a barista by trade,“ Kieran says. The centre also uses an app called Storypark that allows parents to see photos of their children as they grow and learn. Kieran, Karen and their team work hard to help pre-schoolers express themselves. The couple combine the best of two different early learning philosophies – Montessori and Reggio Emilia, Kieran explains. The Montessori approach focusses on structured learning and encouraging students to observe the world around them. The centre has self-help stations and science and maths areas to support this form of childcare. Reggio Emilia, on the other hand, encourages kids to develop relationships and express themselves through art and language whilst having a great deal of fun. “The theory is that through leveraging the two philosophies the children will enjoy learning and will develop a love of learning for the rest of their lives,” Kieran says. 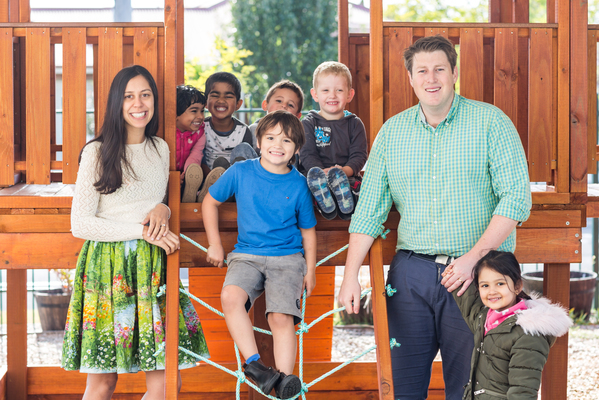 Kieran and Karen opened their Norlane centre after taking over Kids World in Werribee in 2017. “We live just around the corner in Corio,” Kieran says. Kieran worked for ten years in childcare after completing a psychology degree majoring in child development. But he grew tired of working in corporate centres that treated children “like numbers”. He and wife Karen, who worked as a midwife and nurse for a decade, put their creativity into the centre.